Oh so cute! 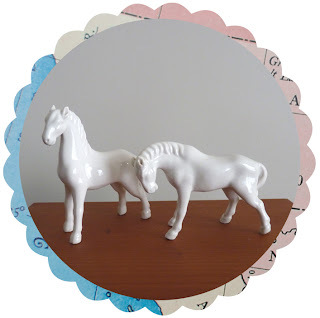 miniature porcelain horses. This was one of those try not to squeal out loud moments. I have been looking for something similar for so long and now I have a pair! and I have some exciting makeover plans for these two... stay tuned. It's been so cold recently I think I am subconsciously compelled to buy everything warm and fluffy. 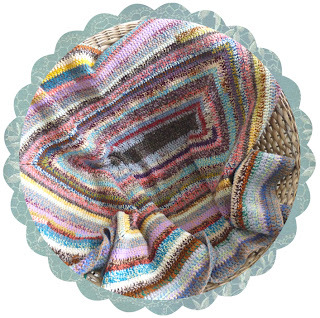 This little knee rug was so kooky looking with its strange grannyesque colour combinations (it looks a bit muted in the pic but there are actually fluro yarns in there) and at just $2 it really wanted to come home with me, so it did! Turns out I needed a little knee rug in my studio - but man do I feel I have aged a tad sitting here typing with it on my knees. Just as well you cant see me huh! 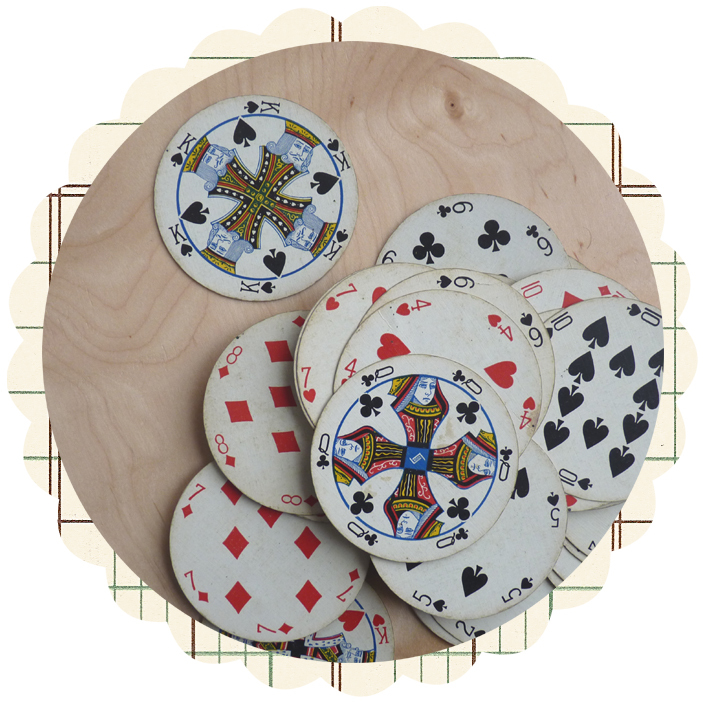 I actually have no excuse for buying these apart from the fact that I had never seen round cards before and they look kinda cool. I'm sure I will find something to do with them one day - except for playing with them as it totally didn't occur to me at the time to count them first! You see it really doesn't take much thinking on my part before some weird little object comes home with me - I have a very serious vintage addiction and no plans at all for rehab. I try not to go out vintage shopping with an expectation of what I need or might find because it inevitably leads to disappointment and I find it means I'm too focused and I miss stuff. 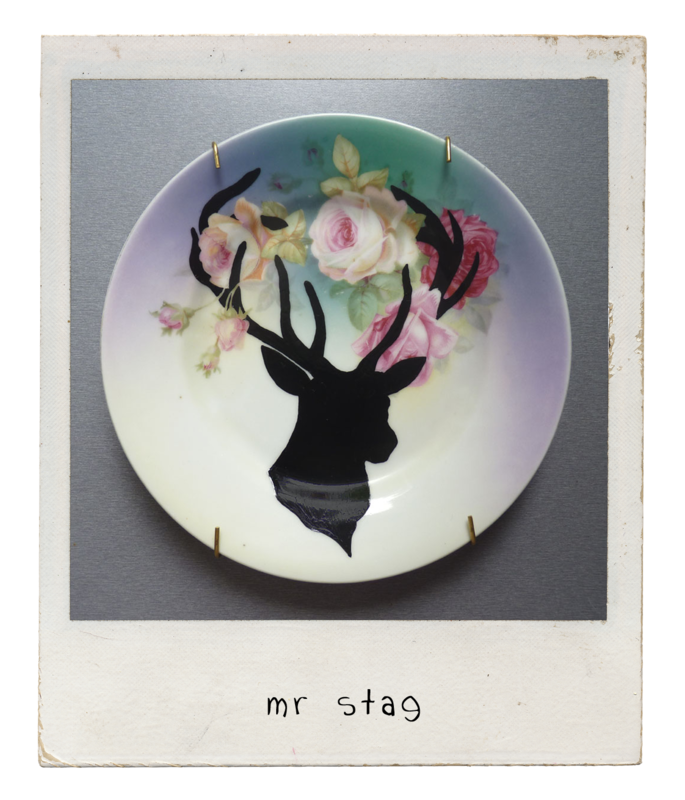 But I really really needed to find some plates suitable for painting Mr Stag. He is proving really popular and believe it or not in my STACKS of vintage plates (remind me to show you, because the collection is looking quite impressive - bordering on compulsive!) there are none suitable. To my surprise I found five - just sitting there in one shop. It was just like someone had hand picked them and had them waiting for me. Yay! And look at those two at the top - gorgeous. No idea what they will turn out to be just yet. Hi Dianne! Thanks so much. 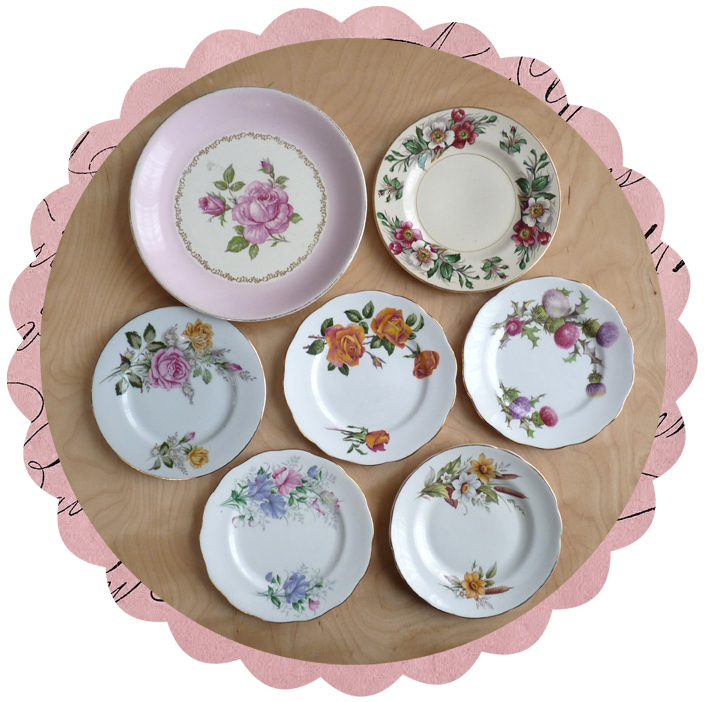 I will definately be putting up some pics of my stash of plates sometime soon. I just need to tidy the studio a bit first - don't want to subject everyone to the mess just yet! Isn't that plate beautiful - what are your plans for your one?